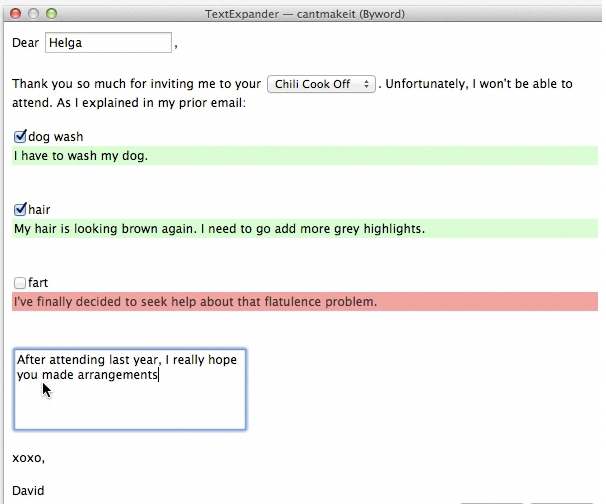 Smile on Thursday released TextExpander 4, the latest incarnation of its typing shortcut utility. Among the new features are additional options for “fill-in-the-blank” snippets, fill-ins for multi-line text fields, dropdown menus for multiple choices, and optional text blocks that you can trigger as needed when expanding a text snippet. But because TextExpander 4 can’t adhere to Apple’s recently-enforced sandboxing guidelines, the new version of the app isn’t available in the Mac App Store. The advanced fill-in features make TextExpander 4 considerably more powerful than its predecessor, particularly for creating large blocks of configurable boilerplate text. With minimal effort, you can create text expansion templates that include all sorts of blanks, optional sections, and dropdowns: You type your TextExpander shortcut, and a floating window appears in which you can customize all those sections before your fully realized text is inserted into the current document or field. Macworld contributor David Sparks created a screencast demonstrating the new features; note, however, that the screencast amusingly contains an instance of adult language. Those features are in addition to TextExpander’s existing offerings, which can quickly turn text like “lfbio” into “Lex Friedman is a staff writer for Macworld,” along with considerably more advanced expansions. For users new to TextExpander, the software now includes a Snippet Creation Assistant that offers step-by-step guidance on how to create expansion shortcuts. A new license for TextExpander costs $35; upgrades are available for $15—though if you purchased TextExpander after January 15, 2012, you can upgrade for free. Smile, for its part, has worked to ensure that Mac App Store customers aren’t left out of the discounted upgrade pricing: If those customers now download TextExpander 4 directly from Smile’s website, they will still be eligible for upgrade pricing; the app should note the presence of the Mac App Store version and offer the discounted price. TextExpander 4 requires OS X 10.7 (Lion) or later.